A very nice private one bedroom suite with private entrance, private bathroom, your own kitchen with cooking facilities as well as your own living area with big screen TV, fireplace, also has a den with an extra single bed and a futton mattress to throw down in the living room. Our home is a 10 min walk \ 2 min drive to the Paradise Canyon golf course or 20 min walk \ 5 min drive to the University of Lethbridge. The entrance is a walkout basement backing onto a park storm pond with a flowing stream. You have exclusive access to the downstairs BBQ, patio table, fire pit and rear grassed yard. The suite is over 1,000 sq\ft and is all for your private use with large windows, 9 Ft ceilings and lots of light. There is a kitchen with all cooking facilities, all you need is food. There is also a washer\drier to use upstairs if you need. We live on the second floor and have dogs, must be comfortable with dogs around. 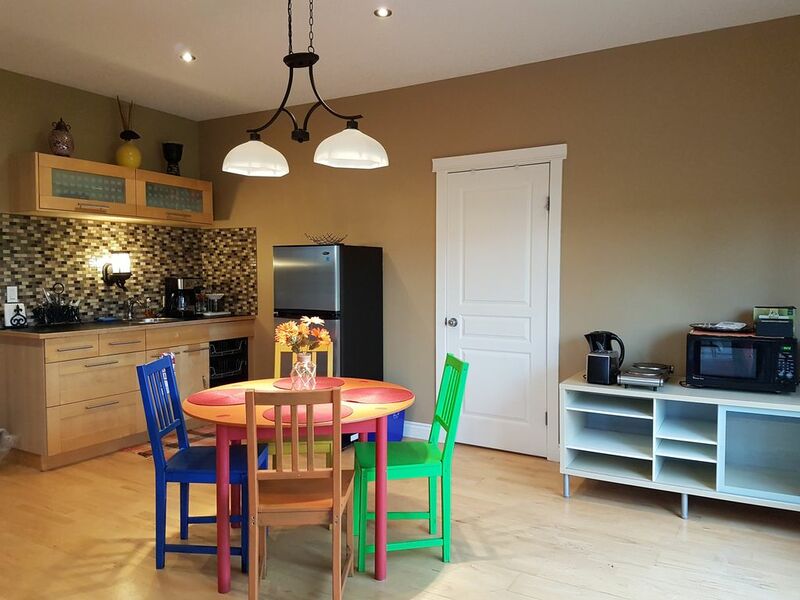 The basement suite is modern and recently renovated, the house is less than 13 yrs old. We have live in this house for over 12 years and love to have guests from out of town/out of country. Originally from BC, Canada and Monterrey Mexico my wife and I enjoy meeting new people and providing our home as your home. Location and comfort. There is little accommodation on the west side. Our location to Paradise Canyon golf course and the University of Lethbridge is a bonus, in addition to backing onto a beautiful park. We enjoyed our stay at this property. The bed was very comfortable, and the gas fireplace was a treat on a chilly evening. The microwave and hot plate were just enough to make some simple meals. We enjoyed the backyard and patio. A back gate opens onto the community park that contains a lake, playground, and winding walkway. Just a few blocks away, we discovered a gravel walk along the canyons with beautiful views of the Lethbridge Viaduct bridge, the coulees (valleys formed by the glaciers), and a beautiful golf course. Darwin and Sandra are super friendly hosts who are accommodating and quick on communication. Quiet neighbourhood and good location in relation to the city, University of Lethbridge and our destinations, but a car is definitely required. Lots of space. You may have the downstairs, however sound travels from the upstairs. Lots of little touches which makes it feel like you're at home. Great value. A few minutes from most city amenities, car required. No shortage of hospitality AND a sweet little vacation spot if you need a simple getaway! This place is in the heart of Paradise Canyon backing onto a small marsh and a walking path close to the community pond. Highly rated 18 hole golf (resort) minutes away. We enjoyed the bbq, firepit & fresh ground coffee offered up! !